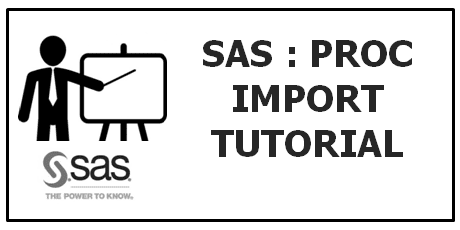 PROC IMPORT is the SAS procedure used to read data from excel into SAS. This tutorial covers how to import excel data to SAS with PROC IMPORT. Loading excel data to SAS is one of the most common task of a SAS programmer / analyst. Most of the raw data files are saved in MS Excel so we need to take it to SAS for further analysis. For example : DATAFILE = "C:\Desktop\age.xls"
i. OUT = Age . In this statement, PROC IMPORT uses the WORK library. This implies OUT = Age is equivalent to OUT = Work.Age . In this statement, PROC IMPORT uses the Input library (Permanent library). 3. DBMS= option tells SAS the type of file to read. 4. REPLACE is used to overwrite the existing SAS dataset (If any) mentioned in the OUT= option. 5. SHEET= option is used to specify which sheet SAS would import. i. SHEET = "Sheet1" - To import data from worksheet named sheet1. ii. SHEET = "Goal" - To import data from worksheet named Goal. 6. GETNAMES= YES tells SAS to use the first row of data as variable names. By default, PROC IMPORT uses GETNAMES= YES. If you type GETNAMES= NO, SAS would not read variable names from first row of the sheet. 7. DATAROW= option is used to specify starting row from where SAS would import the data. For example : DATAROW =5 tells SAS to start reading data from row number 5.
i. When GETNAMES=YES, DATAROW must be greater than or equal to 2. 8. RANGE= option is used to specify which range SAS would import. This would tell SAS to import data from excel defined name range. In the example shown above, it is Information. DATAFILE= "C:\age.xls" tells SAS where to find the Excel file that you want to import. DBMS= XLS tells SAS the XLS (Excel 97-2003) format file to read. REPLACE is used to overwrite the age dataset if it exists already. SHEET= "Sheet1" tells SAS to import data from Sheet1. GETNAMES="YES" tells SAS to use the first row of data as variable names. DBMS=XLSX tells SAS the XLSX (Excel 2007-2013) format file to read. Earlier SAS Versions before SAS9.2 does not support XLSX formatted file (Excel 2007 or later files). If your XLSX file contains records fewer than 65000 rows and 255 columns, you can save the file in XLS format by clicking on SAVE AS >> Excel 97-2003 Workbook. Later you can import the converted XLS file into SAS. DATAROW=5 tells SAS to start reading data from row number 5. 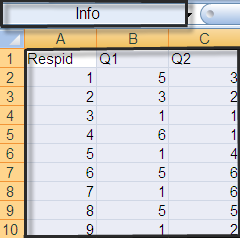 In this case, variable (column) names would be pulled from first row but column values would be extracted from row 5. Suppose variable names are placed at second row in excel sheet. PROC IMPORT DATAFILE= "E:\SAS Code Repository\Book1.xls"
NAMEROW=2 tells SAS to extract variable names from second row and STARTROW=3 is used to pull values from third row. NAMEROW only works with XLS but not with XLSX. The OUT = filename followed by KEEP= statement is used to retain the desired variables. In the example shown above, we retained four variables ID,X,Y and Z. In the same way, you can use DROP= statement to remove the variables that you don't want to retain. For example : You don't want to import three variables say A, B and C.
In the example shown above, WHERE= statement is used to delete all the rows that have only missing data on variables x,y and z.
RANGE="Sheet1$B4:E100" tells SAS to import data from range B4:E100 from sheet1. Range Name: In MS Excel, it is a name that represents a cell, range of cells. You can create your own defined name. Creating a range name is very simple. Select a cell or range of cells and Click on the Name box above Column A and Tye any name you want and Press Enter. In the example below, Range A1:C10 is selected and then type Info in the name box and Press Enter. RANGE="Info" tells SAS to import data from excel using user defined named range Info. The variable names can be renamed using RENAME= option next to OUT= option. PROC IMPORT DATAFILE= "E:\SAS Code Repository\Book1.xlsx"
SAS provides a method for extracting data from web pages by procedure named PROC HTTP. This method makes it easy to read data from web pages. In this case, variable name starts from row number 3 in datafile and data values start from row4 onwards. To import CSV file from website, you just need to change the DBMS=XLS to DBMS=CSV. 79 Responses to "Importing Excel Data into SAS"
ERROR: Output SAS data set must be provided. Remove semicolon ";" after "D:\flowersales.xlsx". I got an error saying :This filename URL access method is not supported by proc import. Please copy the procedure. Thanks for this. How about changing the format of a variable from Character to Number or vice versa in the import? how to import multiple worksheets with proc import? I want to import my xlsx same like xls by using datarow and namerow because i dont now the range.How can i do that? NOTE: The previous statement has been deleted. ERROR: DBMS type XLSX not valid for import. PROC IMPORT DATAFILE= "C:\Users\3537\Desktop\New folder\vital.XLSX"
78 PROC IMPORT DATAFILE= "C:\Users\3537\Desktop\New folder\vital.XLSX"
Which version of SAS you are using? If it is earlier version of SAS than 9.2, DBMS=XLSX would not work. If you have records lower than 65K, you can save file in XLS format and try to import XLS file. Or you can save it in CSV format. I am reading data from an excel file 2013 through SAS EG5.1 version and i have generated an excel file template for the first 30 rows i have entered the dummy values like 1 and TEST for Numeric and text attributes respectively. But When the file is getting imported to SAS dataset it is not retaining the formats. Can anyone please help me out in this. Numeric variables will have length 8 bytes. Character variables will have length 4 as TEST contains 4 letters. Is that something you do not want? Can u provide solved example of Titanic dataset with no of passengers survived? PROC IMPORT DATAFILE= "C:\Users\Puspanjali Sarma\Desktop\try.xlsx"
ERROR: Physical file does not exist, /opt/sasinside/SASConfig/Lev1/SASApp/C:\Users\Puspanjali Sarma\Desktop\/try.xlsx. TRY BY REPLACING XLSX EXTENSION BY XLS IN BOTH DATAFILE AND DBMS. What is the difference between INFILE and DATAFILE? INFILE with INPUT in a data step is also used to import the file and it is more flexible than the PROC IMPORT with DATAFILE option. The downside of using INFILE is everything has to be manually specified whereas Proc Import will do a best guess for column type, width and informats. It guesses wrong when you have so many missing values or space in missing values which makes SAS think numeric values as character values. Thank you Deepanshu. Excellent knowledge sharing by you. I am trying to import a excel file and one of the cell have comments which in the format like - one example is this . this is one comment but after good he has written it is different line but in same cell. Now when i am importing the excel sheet it is pointing wrongly in excel as it is entered in different line . so how may i read this thing in a single line so that it is read correctly. Physical file does not exist, /opt/sasinside/SASConfig/Lev1/SASApp/E:\SASUniversityEdition\myfolders\income.xls. Create a shared folder. To create a shared folder open your workstation->shared folders-. create a shared folder. upload data using this shared folder and you're done! use xlsx file insted xls file format, xlsx consist very less size compare to xls and change DBMS= xls to xlsx. convert the xls to xlsx in the excel sheet by using the SAVE AS option. As @deepanshu bhallu said change check the drive once. Syntax error while parsing WHERE clause. this option will not be recognized and ignored. What are the variables we are talking about(x,y,z) in this case? X,Y and Z are numeric variables having missing values. We want to keep only rows that have non-missing values in all these 3 variables. Excellent Work. Very helpful tutorial. Thank you for all this. Great stuff :) Thank you! Is there a way for me to define the type & length I want each variable to be? Or does proc import not allow this? PROC IMPORT does not allow this. Instead you should use INFILE with INPUT to accomplish this. Post your full code. What is comman? If a file i am importing from excel has spaces in the file name, can I use A FUNCTION to determine what my dataset name should be? Bit disheartening when even the really easy doesn't work. Was trying to import a file and error message tells me that the file location doesn't exist. (Aren't computers lovely when they make that sort of statement!?") Any clues anyone??? Am using SAS academic on demand Studio on Windows 10 (so I don't actually need to code this in, as I can press an upload button, but am trying to learn). I have quadruple checked that I have the right path in my IMPORT statement? I put my file to import in the v simple directory C:\temp. ERROR: Physical file does not exist, /pbr/biconfig/940/Lev1/SASApp/C:\temp\CS2.xls. while I'm importing the data from excel sheet(xlsx) to dataset i have a truncation issue.how can I import with out truncation. and what's the maximum length I can assign. Is there any procedure to assign with out truncation. Truncation normally occurs in character variables. Hence I would suggest you to take a suitable length like 100 bytes so that there is no scope of truncation. 100 bytes is a good limit and most probably,all the values should be within this size limit. can we use informats in proc import? I am importing an excel sheet which has dates. By default proc import is reading dates incorrectly, so I want to define informats in order to read dates correctly. I tried range with dbms=xls but it didn't work but when i changed dbms= EXCEL it worked just fine? Mine is SAS/9.1..
(1). ERROR: Physical file does not exist, /opt/sasinside/SASConfig/Lev1/SASApp/. (2). ERROR: File WORK.PRODUCTS.DATA does not exist. "Importing an excel file from web page into SAS"
Any help would be highly appreciated. Please let me know if anyone has solution to the problem. As per my understanding only one sheet can be open at one time in SAS. which is done by defining Sheet = "Sheet Name"
The below command is not working when I provided variable name in Second Row of Excel sheet. when I import excel file It still Takes variable name row as an observation and create Variable names as A,B,C...Z .
NAMEROW only works with XLS. Typo corrected in the article. I copied and pasted the path. I DONT KNOW IF THERE IS A INTERFERENCE WITH THE SHEET AND RANGE KEYWORDS.